Partnerships between arts organisations working with the Deaf and Maori communities and theatres collaborating to solve technical issues over hearing loops are among the many positive outcomes of an ongoing consultation process following the release of Arts for All: opening doors to disabled people. The practical guide on the arts and disability, published by Creative New Zealand in partnership with Arts Access Aotearoa, was launched in December last year. Regional workshops have since been held in Auckland, Wellington, Christchurch and Dunedin, and last week groups of representatives from arts organisations in Wellington met for a series of follow-up cluster group sessions. Similar cluster meetings are being planned for other regions next year. The four cluster groups involved in meetings at Toi Pōneke Arts Centre last week covered performing arts venues, theatre and dance organisations, visual art galleries and museums, and touring organisations. Wellington City Council partnered with Arts Access Aotearoa on the initiative. 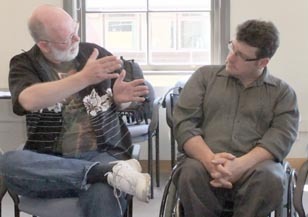 Disability awareness consultant Stewart Sexton participated in each of the cluster group sessions. Arts Access Aotearoa community development manager Emma Chinnock says the networking benefits of the process have already been massive. Other issues discussed by the performing arts venues cluster included the use of audio descriptions for vision-impaired people, sign language interpretations for Deaf audience members, and the possibilities of allowing vision-impaired people to explore stages before or after performances. Touring organisations talked about the need for training for front-of-house staff on how to help disabled patrons, sharing information on the accessibility of various venues – among the touring organisations and with potential patrons in the disabled community – and using the collective leverage of touring organisations to encourage venues to improve accessibility. The visual art galleries and museums group, which included representatives from Te Papa, the City Gallery and Toi PÅneke, discussed initiatives such as making public tours more accessible to disabled visitors. Odd Socks Productions, which creates performance and training opportunities for Deaf and hearing arts practitioners, was represented at several of the cluster meetings. The group is keen to engage with mainstream arts organisations in Wellington to have more signed performances at a reasonable cost. Emma said a high percentage of children in the Deaf community are MÄori, so Taki Rua Productions is looking at partnering with Odd Socks to develop programmes, and one of the MÄori theatre company’s staff is planning to learn sign language. The executive director of the New Zealand International Festival of the Arts, Sue Paterson, has a partnership with a vision-impaired person to work towards making sure the festival’s programme information is accessible. Other organisations involved in the Wellington cluster meetings included the Royal New Zealand Ballet, BATS Theatre, Chamber Music New Zealand, New Zealand Opera, Vector Wellington Orchestra and Capital E.
The Wellington meetings are being used to pilot the cluster group concept. Arts Access Aotearoa will be keeping in touch with the people involved in the Wellington groups to follow their stories, and profile and record the progress they make on accessibility at events over the next few months, before taking the concept to other regions. Preliminary discussions have already been held with community development, arts and culture executives at the new Auckland Council. Emma has been impressed with the response – and enthusiasm – from art organisations wanting to be more inclusive as they look to build their audiences. “The cluster sessions in Wellington were only last week, and already many of the organisations have come back to me seeking advice on policies such as ticketing and other aspects of accessibility. Original generation time 1.4954 seconds. Cache Loaded in: 0.0004 seconds.